Making a career change is a big step. It can be difficult enough to improve your job search, but to try to look for an entirely different career can be stressful and take a lot of sacrifice. Before you take the plunge, here are five questions you should ask yourself. 1. Am I really ready for a career change? 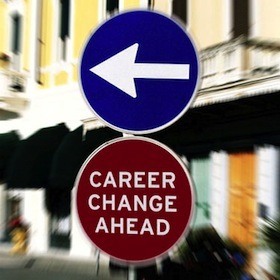 Before you make the leap, ask yourself if you are truly ready to completely change careers. It could be possible that you are just not satisfied with your current employer or your current position. Things like a rough commute, a negative work environment, or even not getting along with your co-workers may cloud your judgment as to whether you are satisfied with your career. Take time to figure out what is really making you unhappy about your current position. Check out Career Builder’s quiz to see if you are ready to switch careers or just need to make changes in your current career. 2. What will I have to do to be qualified for this career? It may take a lot more than just switching job titles if you’re starting a new career. Jobs that require a specific college degree can take a lot of time and money to pursue. Even if it does not require a college degree, several positions involve being certified or enrolling in a rigorous training course. Everything from a hair stylist, child care provider, electrician, and even bartenders, can require specific coursework and a specific set of skills or experiences. To figure out what you will need, search current job openings to see what is required for the position. Reach out to people currently in your field to ask what is required for the job. 3. Will I have to go back to school? If your career change requires you to go back to school, that is a big commitment. Pursuing a higher degree or attending school for any reason requires a great deal of money, time, and hard work. Just like with finding out other types of requirement, check current job listings to see what type of education and degree is required. Also, search for people on LinkedIn with a similar position to see what their education level and degree is. 4. Will I be taking a pay cut? Many times something that goes along with changing careers, is starting from the bottom. This means you might have to take a pay cut from what you are making now, especially if you’ll have to be attending school or complete a training period first. CareerBuilder offers a salary calculator that estimates a possible salary based on your job title and the location of where you are working. 5. Will I actually be able to find a job? Even after you determine it’s worth pursuing all that’s required of a career change and if you’re willing to take a pay cut, you have to consider how likely it will be for you to find a job in your new field. Check the U.S. Labor Bureau website to see what is the job outlook for the position you are seeking. You can see if your job is in high demand and if a need for that job is expected to grow, decline, or stay the same in the next few years. Also, do a search for open positions in your area to see if there is anything available. Changing a career without finding a new suitable job is never a wise decision. One should only go for a job change after keeping in mind all of above questions and once have a job equivalent or better to your current job. “Will I be taking a pay cut?” – If you will have to change your career with a not related industry from what you have now, then absolutely you will have a pay cut. This is one of the reasons why most people frown on making a career change. You will have to start from scratch when you have to do it. Your employer will pay you based on your skills and experiences. Of course, you won’t make much.